On the surface, wallpaper removal looks easy. You wet the wall with a wallpaper stripper and use a scraper to strip it off. How hard can it be, right? Well, let’s just say it isn’t as easy as it looks. 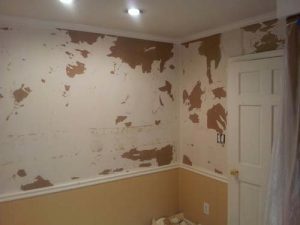 Those who’ve actually done it before know that removing wallpaper is no walk in the park, which is why Osborne Painting provides professional wallpaper removal to homeowners in Raleigh, Cary, Durham, Chapel Hill and beyond. After we remove the wallpaper and borders, Osborne Painting can sand and paint the interior in that room or set of rooms, too! Fast – Don’t rely on a friend or family member who bragged about how easy it was for them to remove the wallpaper in their bathroom. 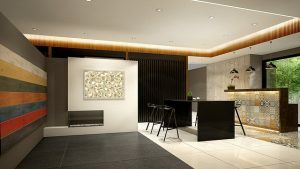 Every job is unique and the difficulty is dependent upon the primer used at installation, the quality of the sheetrock, and the material the wallcovering is made of. Our staff is quick — we can have the wallpaper removed promptly. 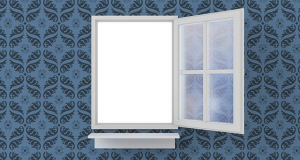 Convenient – Removing wallpaper isn’t an easy job for the uninitiated — the task requires the proper tools and training. We can’t tell you how many times we’ve been called to a home in the Raleigh area to finish removing wallpaper only to find that we now have to repair drywall, too. Don’t stress — Osborne Painting is here for you! Is it a good idea to paint over my wallpaper? Painting over wallpaper can be a great choice if you want to give your home a more contemporary and lively feel. If your wallpaper has been on the walls of your home or office for years, unexpected damage can likely occur when removed. By appropriately preparing your walls to be painted, you can likely avoid inconveniences and setbacks such as having to redo sections of the project and damaging the drywall of your home, office or establishment. If you have any questions about our process for prepping walls to be painted, we would be happy to answer them. Can you remove wallpaper from drywall? Yes, you can. The experienced professionals at Osborne Painting understand what works and what doesn’t work when it comes to removing drywall and giving your home, office, or establishment a revamped and more contemporary look. Our services don’t just begin and end with painting — Osborne is a full-service contractor, meaning we can handle all of your needed repairs and installations prior to the painting process. Painting is often the last piece of the equation — the transformative icing on the cake! In many instances, drywall needs to be repaired, windows can be replaced and damage from fire, smoke, water, and termites can be fixed before painting begins. When you choose Osborne Painting for Raleigh interior painting needs, you can rest easy knowing you’ve chosen a company committed to quality, at the fairest of prices. Along with that, be sure to check out our blog article covering how to choose interior paint for your Raleigh home. Contact Your Raleigh Wallpaper Removal Company Today! Along with that, if you own or manage a commercial property and find yourself in need of interior restoration services, contact Osborne Painting and ask for additional information by calling (919) 878-6611.